Today guide will base on how to make lyrics display while watching music videos on YouTube. Although, YouTube don't have that feature yet, but you can see how possible that is after undergoing the steps provided below. This is made possible with the making of a third party extension on browsers you use. The enjoying part of music videos that inspires and touches ones heart, is when the person is understanding the lyrics and same time flowing with the cool sound beating out of the music video. Once you are watching a music video and the lyrics is displaying, you will found out that, learning the music won't be difficult for you, as this will enable you to learn it fast. So, let's get down to how you can set any music video on YouTube to display lyrics. Is your PC ready for this set up? if yes, then goto to musixmatch addons and make sure to add the extension to the Google chrome browser you are using. In few seconds, that will be added to your extensions. That's all for Google chrome music lyrics display set up on YouTube. Now, goto any music video of your choice on YouTube, play it and see the result, as it will automatically show the lyrics of that song in order for you to read. 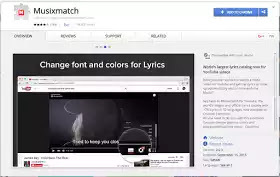 No much difference between the set up lyrics for Google chrome browser with Mozilla Firefox browser. 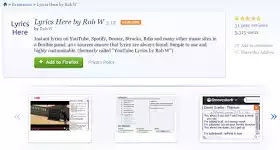 Almost the same procedure, all you need to do here, is to use this particular video lyrics extension, (get it here) for Mozilla firefox. Next, is to click on "Add to firefox" As usual, wait for few seconds in order for the addons to install it. After installing it, that's all, you can now forward to YouTube for watching of music videos. Don't be surprise, the lyrics will automatically display while the music is playing. Enjoy the real inspiration while reading the lyrics of any song. Got any contribution to this post, pls kindly share it with the comment box below. And don't forget to share to friends, thanks as you do so.